Monte quietly left us for Rainbow Bridge on 18 November, 2008, just two weeks after his 12th birthday. 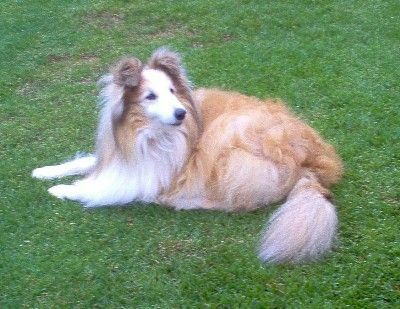 For the previous year and a half he had bravely fought Cushings Disease and Hypothyroidism, and while these ravaged his body, the tenacity and strength of the sheltie character shone throughout. Monte was an extremely glamorous boy. He had the most appealing expression with beautiful, dark almond shaped eyes; and as he carried a huge golden coat for most of his life, he was a standout in the ring. Gaining his title easily, Monte went Best of Group and Puppy in Show at Ashburton KA, so qualifying him for the very first Supreme Puppy of the Year Competition to be held in 1998 at which he won the Best Working Dog Puppy title. This dear dog is so very much missed by the family - go well until we meet again.